The Best Father’s Day Ever !!! One month ago our family moved from our home in Locust Grove to our new home in Stockbridge, Ga. Our new home is located three houses down from the first house that we purchased eight years ago when we first moved to Georgia. It’s strange the many twists and turns that God has led us on. Never in a million years would I have imagined us moving back to our old neighborhood. Our home in Locust Grove became too expensive for us to keep so we leased it out to a nice family and are praying that are enjoying their stay there. Our friends Mark and Jenn have a rental home that became available just as we found tenants for our home. 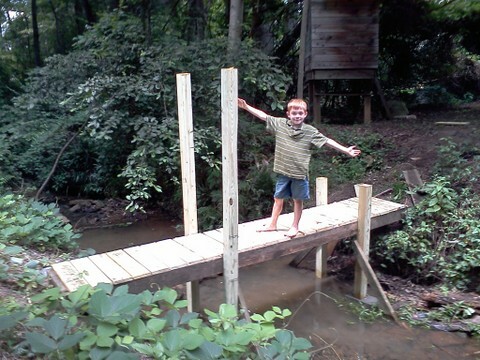 The first time that we came to visit their home our son Noah became enamoured with the creek in the back yard. The kids had a great time playing in the creek and the woods, unfortunately Noah came home with four ticks on him that night but they still had a blast. A big thanks to my Uncle Bob who has his own pest company, he told me what insecticides to apply to our yard to rid us of the ticks and other pests. I ordered the chemicals online and applied them per his instructions and whammo ticks are now gone. What a relief! 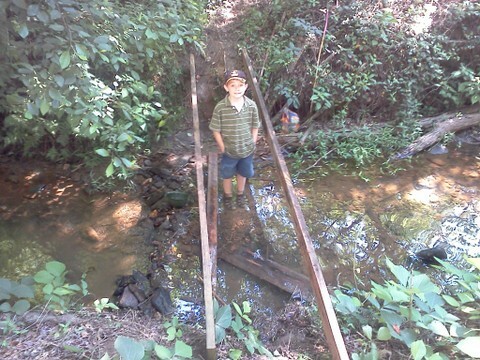 Anyway soon after our first visit our son Noah began talking to me about his desire to build a bridge over the creek in the backyard. Not just any bridge however but a “drawbridge”. Of course I said yes without truly thinking about the difficulty level in constructing such a bridge, especially with my limited experience in construction, save the white picket fence at our first home in Rhode Island. The fence that I finished painting on the day that Noah was born…it was quite a fence! 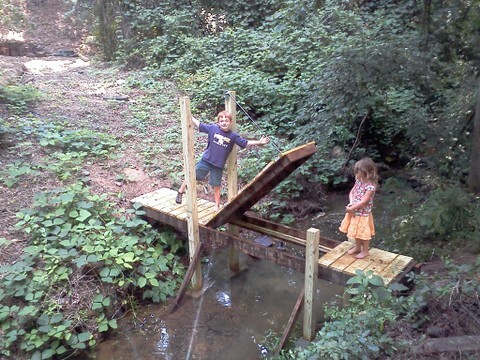 So I agreed to help construct the said drawbridge without any hesitation, we would just have to figure it out. For three weeks we talked about the bridge, we drew plans, we sketched, we measured. 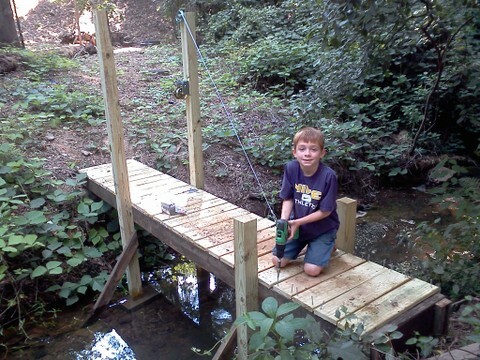 Noah kept asking me when we were going to build the bridge, I was working 7 days a week in addition to going to his Cub Scout day camp with him and was dead tired. 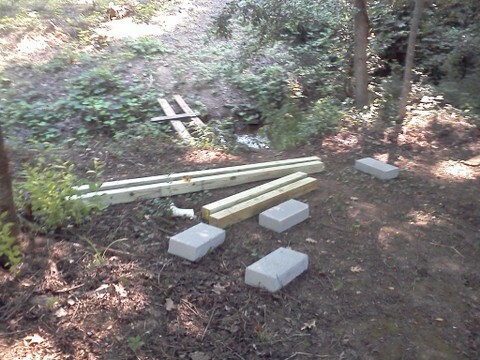 The week of Cub Scout camp I decided that we would start construction of our bridge on that Sunday which was Father’s Day. So we made a list of materials and headed off to Home Depot to buy all of the necessary hardware and wood. The project was substantially more expensive than I had imagined, but as the famous Visa commercial says, the experience, and the result were “priceless”. It took us one whole day and three half days to complete construction. 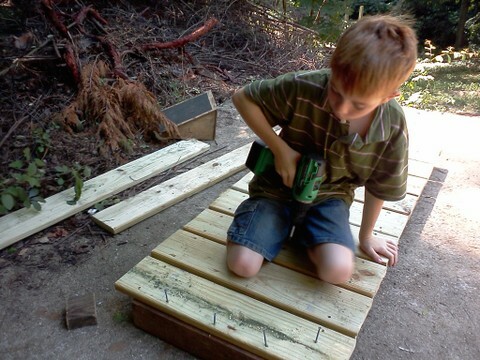 Noah measured every plank twice for cutting per my instructions. 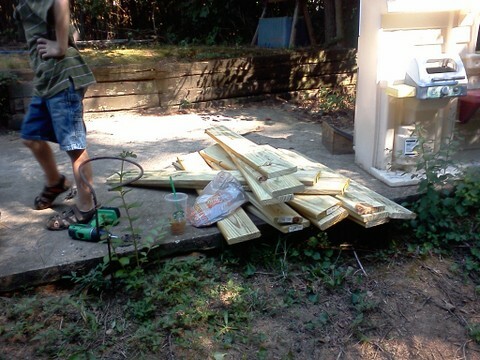 The old adage saved us a few pieces of wood, “measure twice and cut once”. 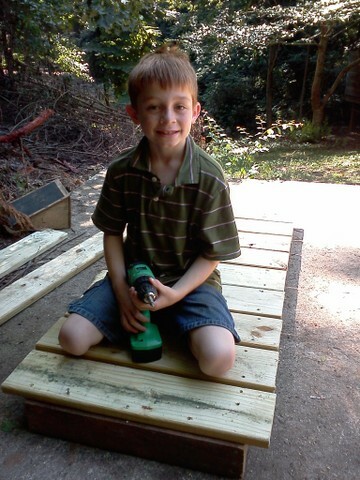 Noah also used the miter saw for the first time, under my very strict supervision of course. 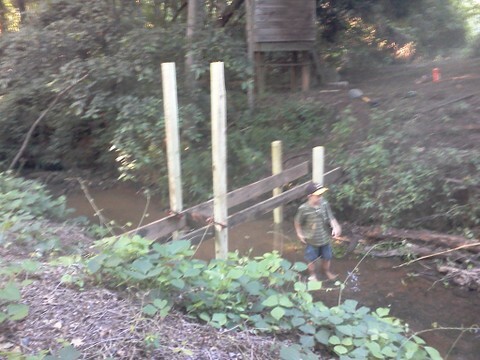 When constructing the frame for the drawbridge Noah screwed in every plank except for a couple all by himself. 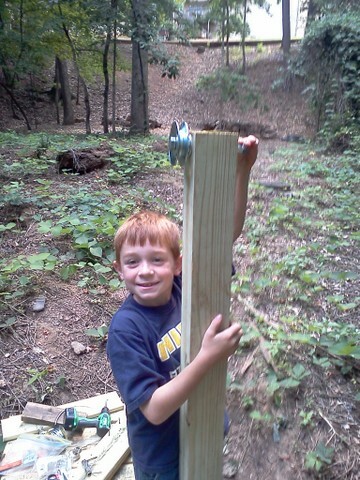 He helped me brace all of the pieces of wood together, threaded the bolt for our pulley system and hooked the cable hook onto the eye-hook of our drawbridge. 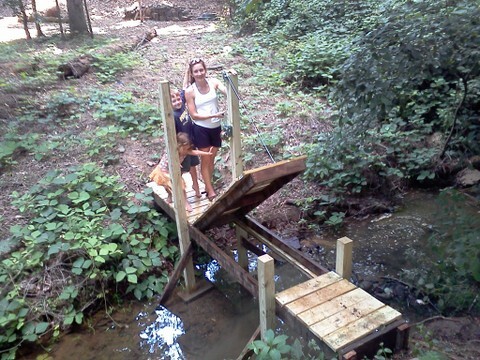 The construction of our drawbridge truly was a team effort. Day one saw much more progress than I would have imagined. The basic components were done but I still wasn’t sure if our drawbridge concept was going to work or not. I was amazed as I know that Noah was as well that we actually figured out how to made it work. 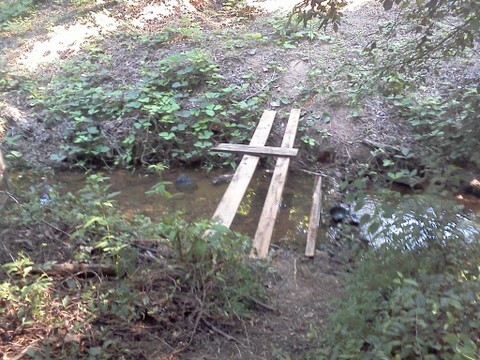 We constructed the bridge from some very rudimentary drawings. 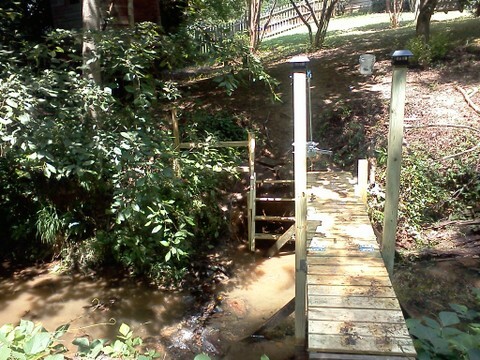 The last day we constructed the stairs that go down to our dam and waterfall. The waterfall and dam were constructed by Noah and our neighbor Alex who came over to help one day, he screwed some screws in the with the drill, and was a big help with the many tasks that I asked him to assist us with. Lastly I applied a couple of solar-powered post caps to our drawbridge that actually work surprisingly well. I plan on purchasing some fish at Walmart to stock our stream after doing some more research. 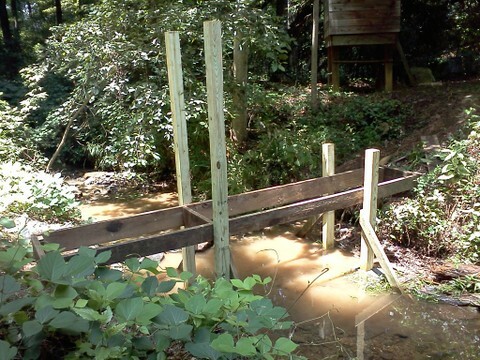 We managed to increase the water level of the stream but at the same time not decreasing the water flow. I can’t wait to see some fish in there. Next on my list of projects is the construction of a wooden tree swing. 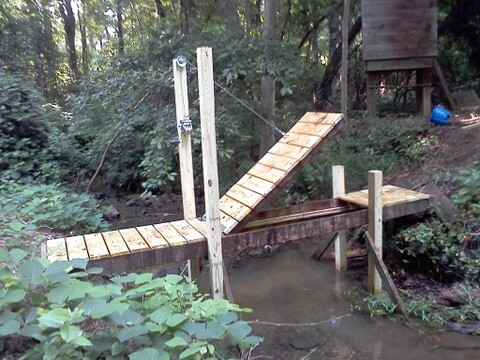 Today I did some research on-line, I can’t wait to construct the swing which will swing out over the creek from a 12 foot high branch. I’ve always dreamed of having a swing like that and I know that the kids are going to love it. On a side note if you are going to construct a drawbridge separating property lines it’s always best to check with your neighbors which I did not. 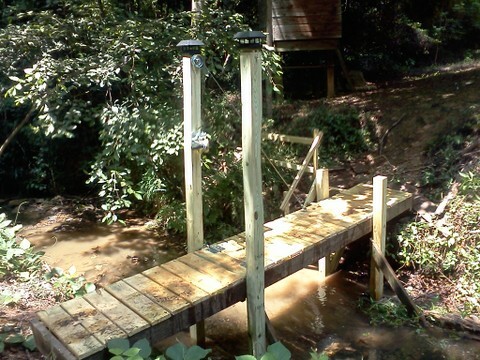 Thankfully our neighbors Steve and Missy kindly let our drawbridge remain in place provided the boys behave themselves on their property, keep your fingers crossed. All in all it was one of the best days and weeks ever, certainly the best Father’s Day I have ever spent. The Annie Clarke Memorial Drawbridge will officially open at our 4th of July BBQ when we will have a ribbon cutting ceremony to commission it for use. 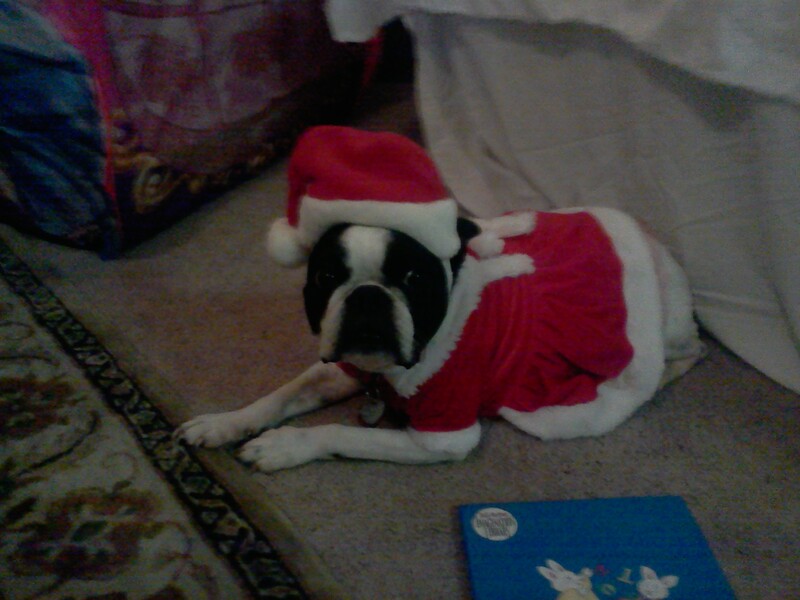 Annie was our 11-year-old Boston Terrier that was hit and killed by a car three weeks ago. The naming of the bridge in her honor was our son Noah’s idea, an absolutely wonderful tribute to a wonderfully loyal and loving dog. All are invited to attend our BBQ and drawbridge commissioning, if you would like to come please RSVP. The BBQ will begin at 4pm, with many fun events planned and with fireworks to follow at Community Christian Church. Around this time last year Tom, my half brother from my dad’s first marriage, died from Lou Gehrig’s disease. I flew up to meet my sister and my dad for the funeral in New Jersey. My dad had been staying with good friends and neighbors from the street on which I grew up while he visited Tom in his last days. After the funeral, my dad and I went back to our neighbors’ house to talk with them before we went out to dinner. Then I asked him if we could walk over to “our old house” so I could take a look. I hadn’t seen it for eight years. He said “sure”. We walked over and as some of you may have noticed when you have revisited your old childhood home(s), it wasn’t quite what I remembered. It wasn’t nearly as tidy as my parents had kept it. It wasn’t quite as large either. But it was still “home” after all these years. My dad said “no” to a lot of offers for promotions and pay increases so my sister and I could stay in that house throughout our childhood. He drove a very long commute to keep us there. I have only begun to appreciate that sacrifice of time as I have watched my husband do the same for our family over the years. As we walked around the house recalling memories together I soaked up the expression on my dad’s face. Looking back brought a smile to his face, the memories were a joy and it was probably a soothing balm in the midst of a grief filled time. He loved that home and he loved “us” in it. In his eyes I felt like I saw the contentedness he felt there. He had his home and he had his family. And it was good. With each passing year as an adult and as a parent, I think I “get” my parents a little more. I think I grasp a little more understanding of what it was to be my dad back then when we were all together in that house. I more deeply appreciate our conversations at the kitchen table in that home as we discussed a good book or music. I long to create the depth of relationship that comes with those connections with my kids now. I now share an understanding of the hard work it required to make that house a home and support a family so we could stay in that home. I can offer my dad a grace I couldn’t before because I had no idea how rewarding and yet exhausting “home life” can be. My dad’s generosity with his hard earned money is all the more appreciated as we try to support our family. 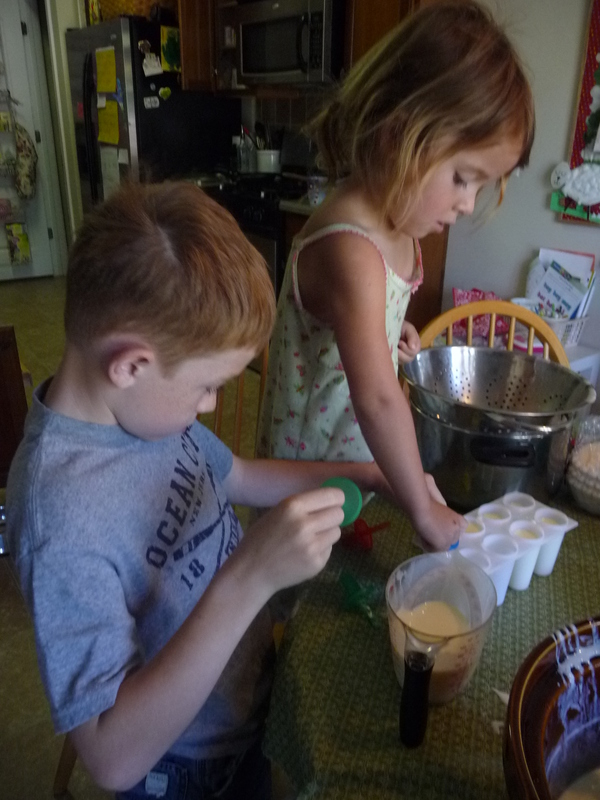 I “get” the joy of being able to give our kids experiences and things because you just love them so much. Thank you Dad for all you did to make our house a home. I know it was hard work and took a lot of time to provide for us. I appreciate how open handed you were with all that was yours. Thank you for being content with being a “family man”. I have been looking for a quote about the danger of following Jesus for awhile. It comes from C.S. Lewis’ “The Lion, the Witch, and the Wardrobe”. It was brought to me this morning by the blog Holy Experience in a post that came in my email. She aptly describes the thoughts of my heart. Click on the title for the post. I hope it both challenges and blesses you. 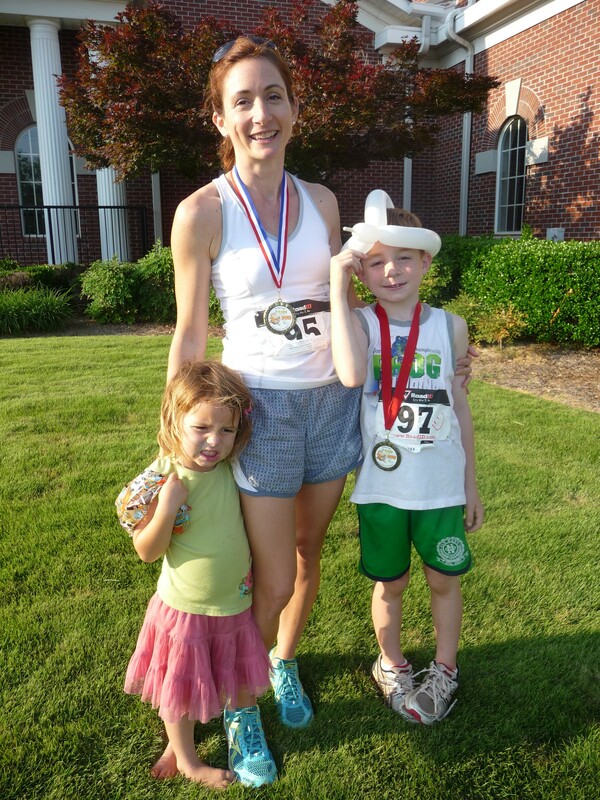 This past Saturday May 5th our family ran in the 4th Annual Run for the Bun 5K. 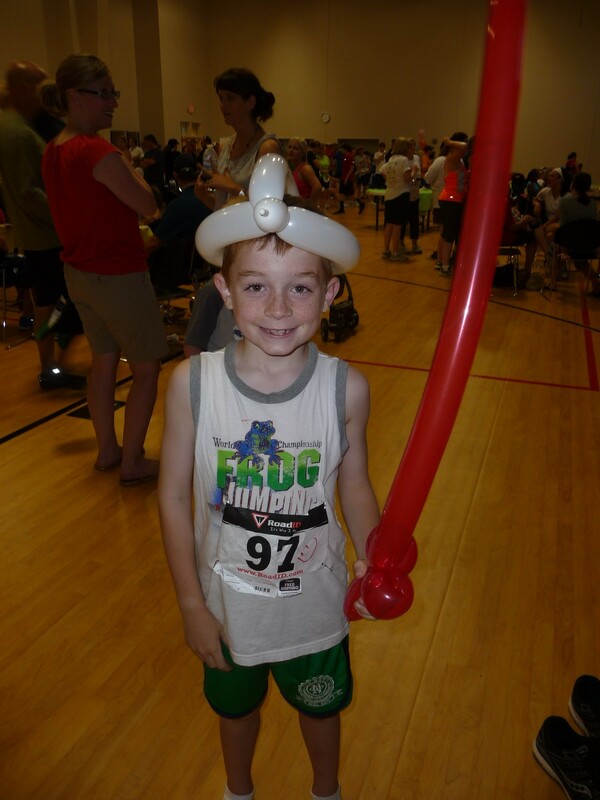 This 5K was put on by the Pregnancy Resource Center of Henry County. This was the first race that Heather, Noah, and I have run together, previously it’s just been Noah and me. Hopefully we’ll have Abby out there soon she’s a fast little runner. The race course was a bear and it had the triple threat of high heat, horrible humidity, and horrendous harrrowing hills. 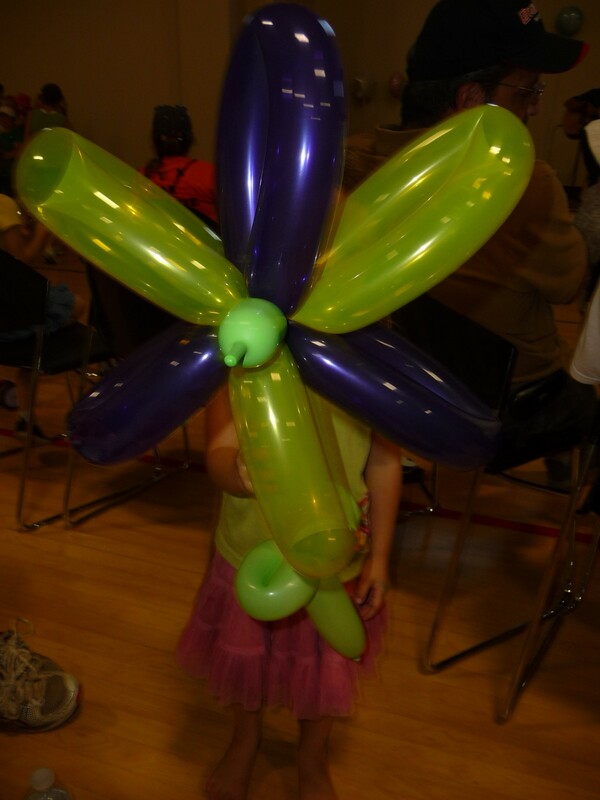 Nonetheless we still had fun, especially with the post race ice pops, chocolate tacos, cookies, pinata, and jumpy house. 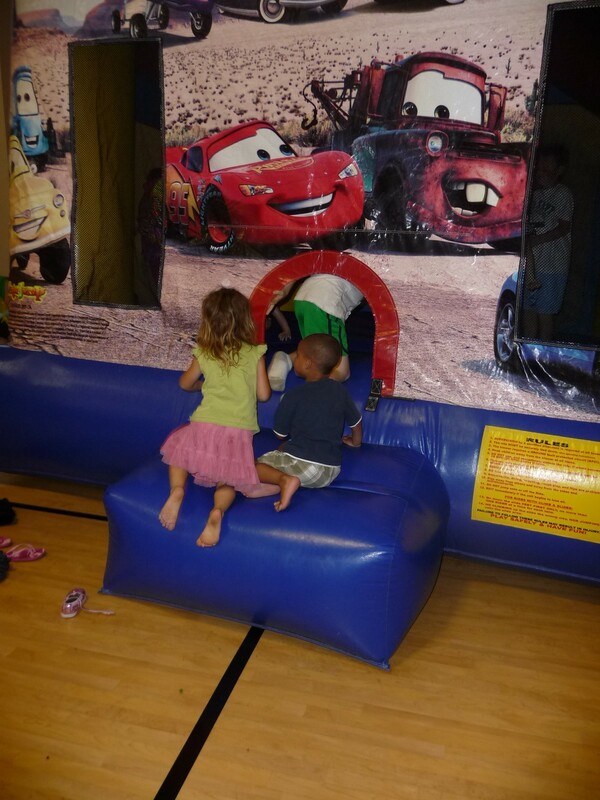 Thankfully this year the post race festivities were in the air-conditioned Bethany Baptist Church gymnasium. 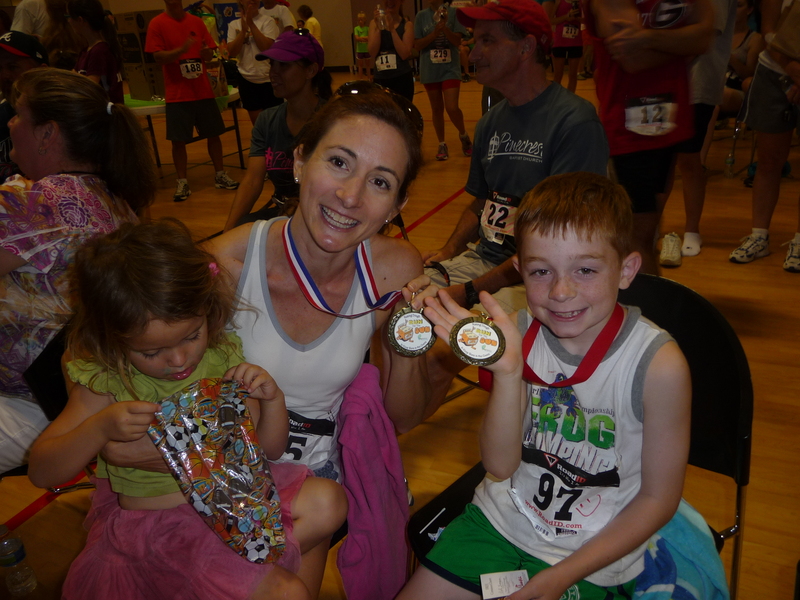 Noah came in third place in his age group, Heather came in first in her age group in her first ever 5K “very exciting”. I was left out in the cold in the bling category. Next year I’m running the 10K, look out Tom, John, and Kevin, Darwish will be mine! I am checking in to give you an update about where things are heading around here. Since the garage sale a week and a half ago, we have received close to 15 phone calls or in-person requests for information about the rental of our home. Beginning Saturday and ending Monday, at least four families will be touring our home. We are hopeful that by the end of next week we will have a renter. If all goes according to plan we will be moving over Memorial Day weekend and have renters in our home by June 1st! Needless to say, May is going to be one busy month. I think about the spot by the kitchen counter where I felt full-on contractions as Little Girl decided it was indeed time to present herself. My husband was on the phone with Little Grandma and Grandpa and completely oblivious to me flagging him down that he had to get off the phone. I remember the countless hours at the kitchen table in front of the double doors that open into the backyard. I sat there and prayed, I sat there and labored over teaching Little Man to read, and celebrated the day there when he finally completed his reading program. I remember the exact spot in the hallway where I fell to the floor screaming by the sudden agonizing pain that invaded my neck, not knowing what was happening to me. My husband crouched down next to me and gripped my head in his arms to keep it still and just held me as I sobbed. 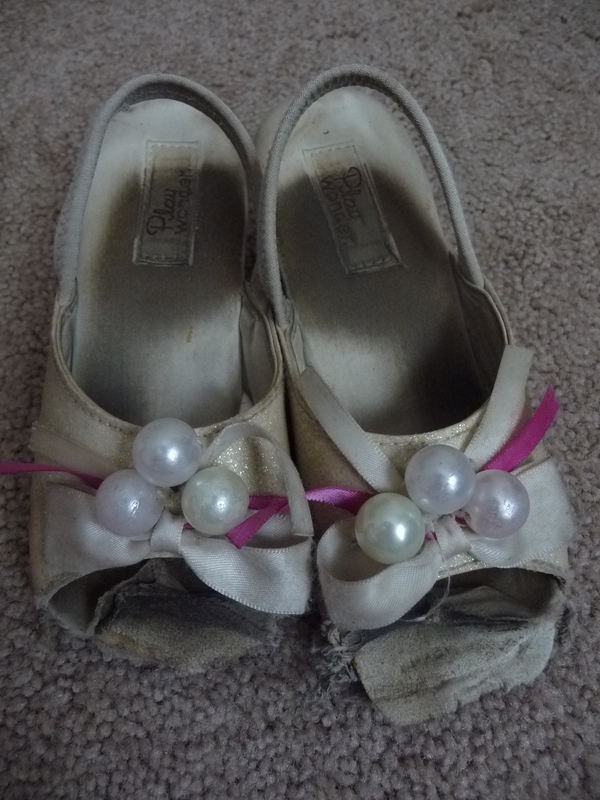 The bathtub, behind bedroom doors, and under tables were spots where all of us hid during games of “hide and seek”. Construction paper depicting clues for scavenger hunts that led to birthday and Christmas gifts, have been taped on doors, in hallways, in the yard, and on the back porch of this house. I remember spending so many hours in the master bedroom deeply depressed by the constant nausea that assaulted my body during my pregnancy with Little Girl. Later I would spend countless hours sleeping due to the strong pain killers that made my life liveable during my journey toward a cervical fusion. I have such wonderful memories of sitting out in the driveway watching our kids play with the neighbors in the cul-de-sac. Little Girl and the toddler next door looked like bobble heads as she drove him around in her Barbie Jeep, oblivious to trees, mailboxes, curbs…..howling with laughter. Little Man and his sweet friend would sit on our driveway day after day building Lego forts and ships or would change from costume to costume drawing from mountains of play clothes. The kids from both our families would take turns competing in dance contests to the tunes of Toby Mac and the Newsboys. My husband and I would sit out on the back porch planning our landscaping which never really worked out) and our raised vegetable garden (which did do well). We spent so many hours on the living room couch in serious discussion or sitting on the couch in the den to watch movies after the kids went to bed. Thankfully we won’t be leaving because we have actually discovered we are dead or are doing some freakish time travel…. We are leaving because it is the next step. God has something else planned. And whether we like it or not, life moves on. SO, thank you 702 Dragonfly Circle for loving me despite my lack of appreciation. You were good to me and offered me what I didn’t know I needed. You helped this family grow and make wonderful memories. You were a blessing and not a curse. As for this blog, the month of May is going to be full of sporadic updates. And the beginning of June most likely as well. But slowly and surely, life will begin to flow evenly again and I will be eager to share what God revealed to me during these coming weeks. The photos above depict the steps I had to take after the milk sat in the unplugged crockpot for three hours. 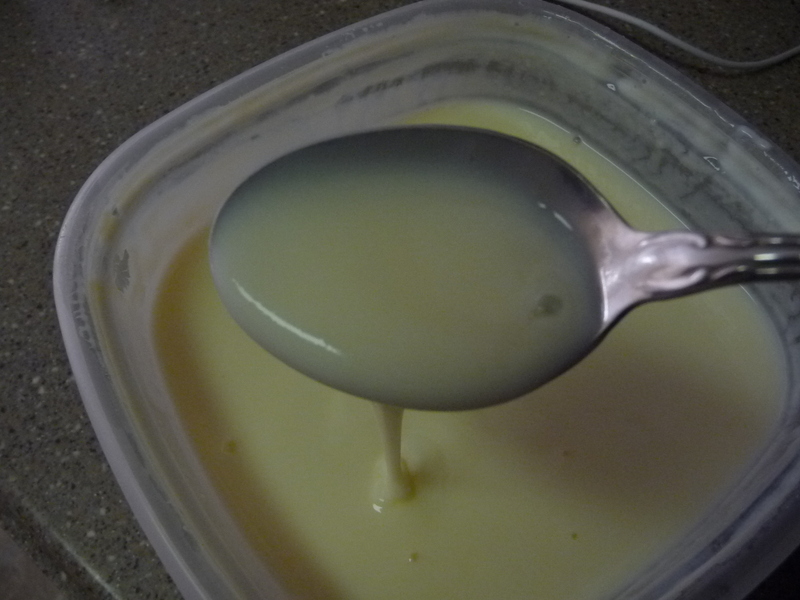 I took out a cup of yogurt and mixed it with the vanilla instant pudding. 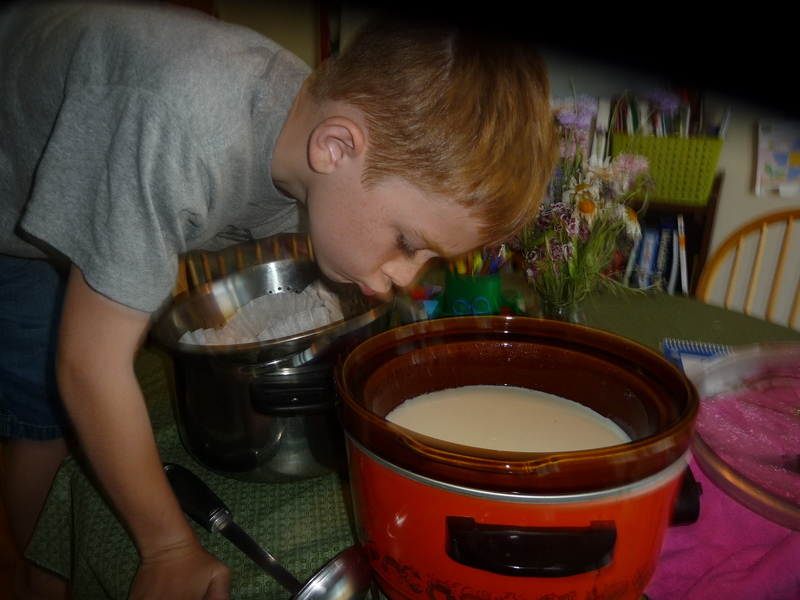 We then poured it back into the crockpot and stirred that with the whisk. 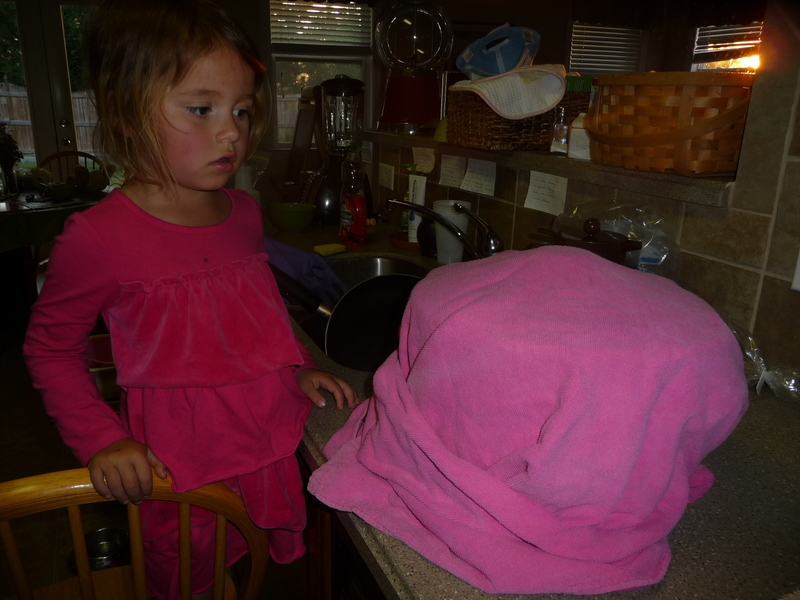 Lastly, we wrapped the towel around the crockpot and left it to sit overnight. 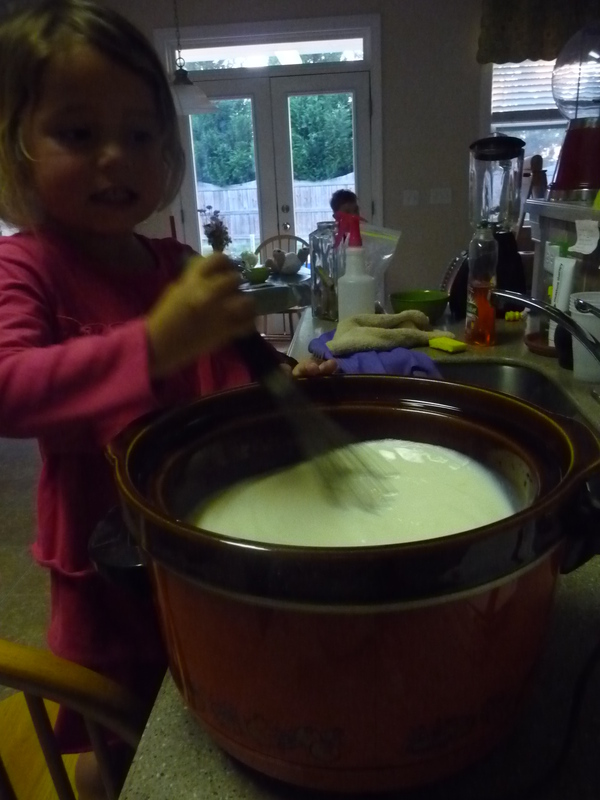 Well, I’m not sure this was a complete success as our yogurt was kind of runny in the morning but here are the pictures and the rest of the steps. 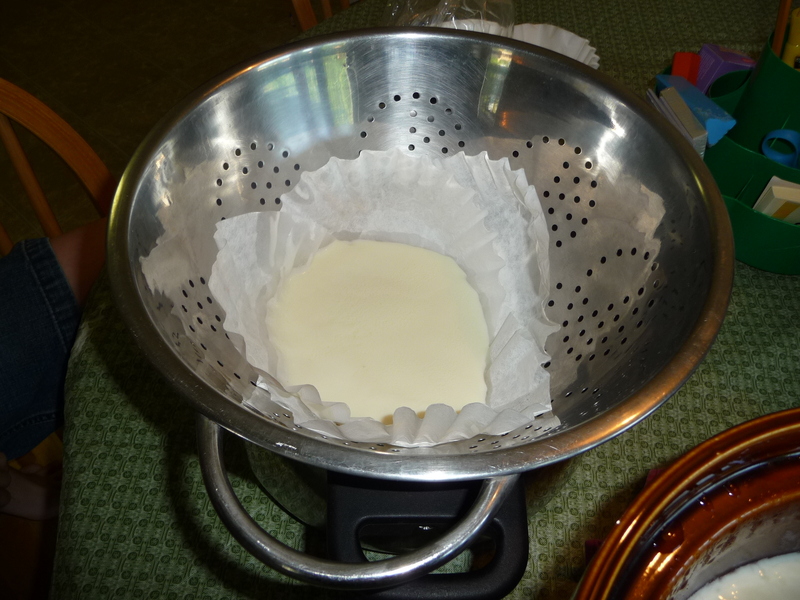 Well, not alot of whey strained through the coffee filter. My yogurt was rather thin. I didn’t have a lot of time but I googled this result for a minute and I think the problem was that my yogurt wasn’t warm enough overnight. I also wonder if it had to do with the fact I used 1% milk rather than whole milk. I don’t think there was a real savings with this project unless I use organic milk next time. Organic yogurt, gogurts, and drinkable yogurt is really pricey. This would be a cheaper alternative in that case. 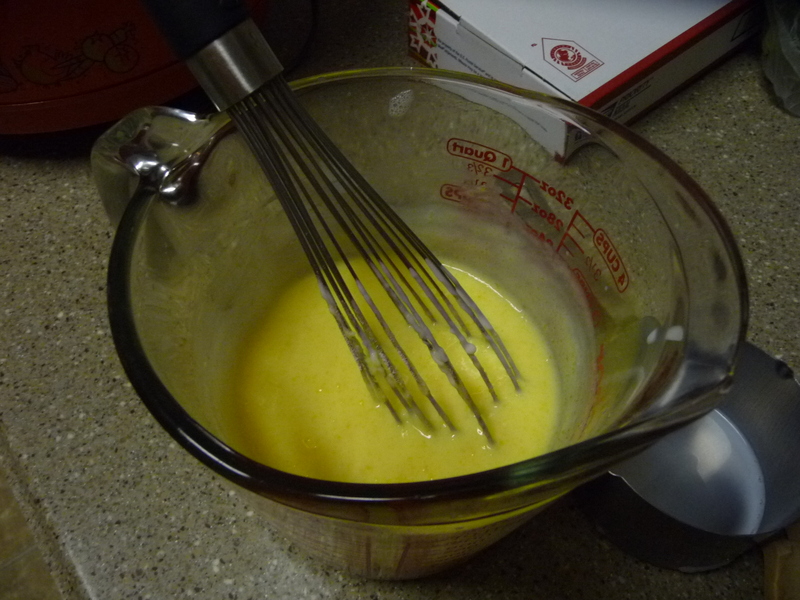 The vanilla pudding really did work as flavoring. Little Man would have preferred chocolate however. It was delicious but like I said, even after being refrigerated, it was a bit runny. 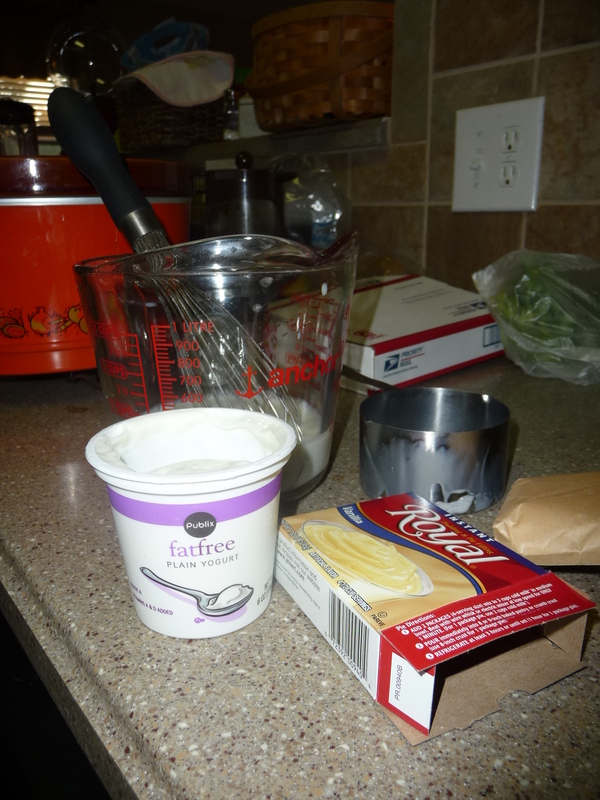 Although, now that I think about it, lowfat Stonyfield yogurt isn’t particularly thick either. maybe this yogurt was closer than I thought. 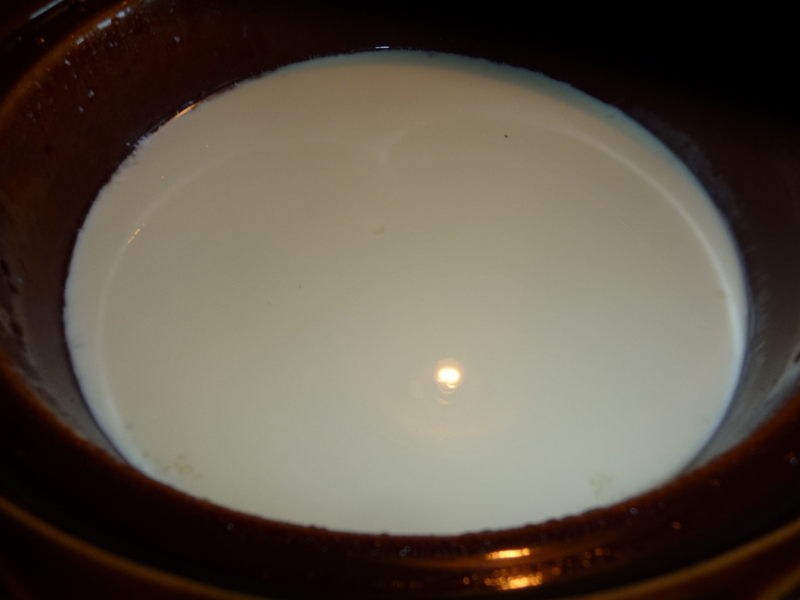 Consistency of yogurt after being refrigerated. 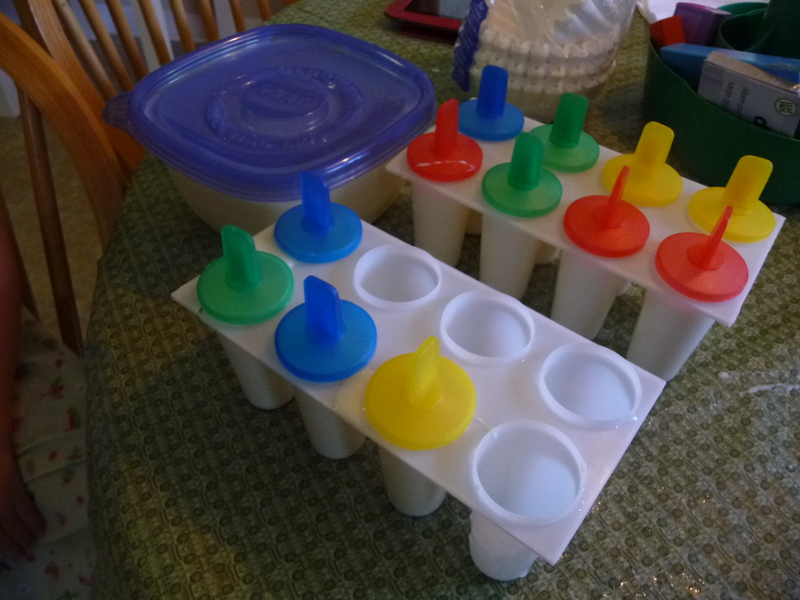 It is perfect for drinkable yogurt and smoothies. In a less busy season of life I may try this again but for now, I will stick with couponing and manager’s specials for organic yogurt purchases. Oh, and Here’s One More!